Frankfurt, Germany – Double A never fails to bring something new to the table as its booth at 2015 Paperworld Frankfurt, located in Hall 3.0 Stand C30, will be filled with new product offerings to meet the various demands of its customers and potential ones from all over Europe, Middle East, Africa and USA, who are flying over to Frankfurt on 31 January to 3 February 2015. Double A will be introducing a complete product range which includes Double A Color Print (90 gsm), a superior color printing paper that gives vibrant color, excellent print contrast and sharper images, and Double A Presentation (100 gsm) that is best suited for all professional work requirements. Like Double A premium 80 gsm, both brands will be noted for the smooth surface and high opacity, thanks to the high quality fiber from KHAN-NA. Double A series will be launched in EU in 2015. 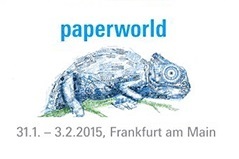 Also, Double A will be turning the spotlight on Evolve Everyday at Paperworld. Evolve, Alizay’s historical paper brand from 100% recovered fiber, was successfully re-launched in July 2014. Evolve Everyday is certified with FSC Recycled and is marketed in reams of 500 sheets. “We are excited to be back and we are looking forward to meeting with Double A customers from across the globe because they understand the market better that we do. That makes Paperworld a unique platform; it offers us the opportunity to learn about the latest in the market from our customers’ perspective, and at the same time we inform them of the latest development on our products and how we can help them achieve their goals through our value-adding offerings”, shared Mr. Thirawit Leetavorn, Double A Senior Executive Vice President.